[By Nick] So in my last Cedar Crest Dairy review I mentioned I order three pints from Ice Cream Source. Well when I received those pints, one of them seemed out of place. While Elephant Tracks and a flavor to be reviewed at a later date (getting the suspense building ;]) both sported their new packaging, their Turtle Sundae was still in their old packaging. At first I thought I got sent the wrong product but once I got a closer look, I saw that it was in fact one of the Cedar Crest flavors. Well let’s just say I can see why they decided to rebrand their ice cream. While the turtle is adorable, the whole pint design is unappealing to me. The colors aren’t the most appetizing and I never liked representing the ingredients involved in cartoon form on the package. I like how the new packaging shows a scoop of the ice cream and the color scheme is far superior. I’m glad Cedar Crest decided to make the change because if I was to see these in the ice cream isle, I more than likely would have passed them up. Okay, enough with the packaging let’s talk about the ice cream. 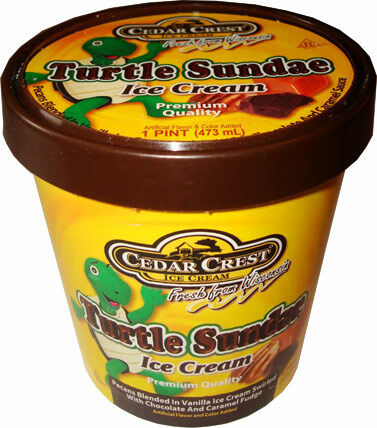 Cedar Crest Turtle Sundae is described as “pecans blended in vanilla ice cream swirled with chocolate and caramel fudge” this is definitely a flavor that was calling my name. You guys know my love for caramel and pecans so adding chocolate only can make things better right? Wait, the lid says it’s “swirled with chocolate and caramel sauce”. I’m so confused right now; I’m just going to go with fudge because, well, I have no real reason. With the lid off, everything seems to be present. The only thing not all that visible is the caramel but there is hints of it around the edge. The texture is a bit on the icy side but retains a bit of smoothness. I’m going to blame this on it being an older pint and I’d imagine it would be much better if it was fresher. The vanilla ice cream is well “vanilla”. There’s nothing mind-blowing or special about it. It’s just your basic vanilla which is always perfect for mix-ins. 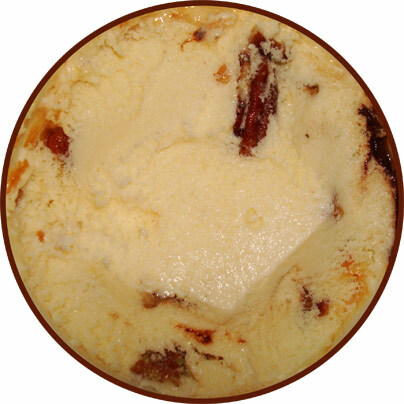 The chocolate fudge sauce is definitely the dominate of the two swirls in this pint, both in flavor and abundance. It carries a decadent chocolate richness with a bit of “goo” factor. This is exactly what you want out of a chocolate fudge swirl. The caramel is practically nonexistent in the flavor department. I can see it but I really have to concentrate to actually taste it. 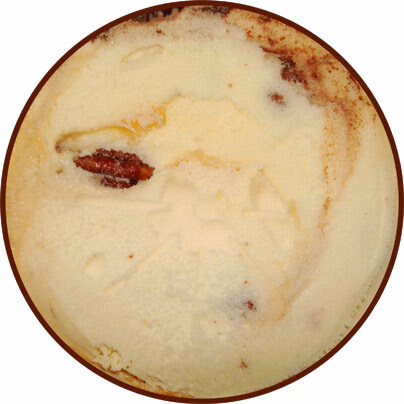 My favorite part of this pint is the pecans. They’re literally everywhere and it’s hard to get a spoonful without one in it. I love pecans so this perfect for me. They add a good amount of crunch and, well, just taste like pecans. They aren’t the best pecans I’ve had but they’re far from the worse. It’s too bad that the caramel was so weak in this one. This would’ve been an awesome flavor even with the iciness that my pint experienced. Verdict? Amp up the caramel, Cedar Crest!